2. Open the app by selecting the AppWeigh App icon on your device. Allow the AppWeigh app access to your device’s location if prompted (you will only be asked this the first time the app is opened). Login using your Facebook account: If you have an existing Facebook account you can login using your Facebook credentials by clicking on the “Login with Facebook” button. Register a new user account: Choose this option if you are installing the app for the first time, and do not wish to use your Facebook credentials for set-up. You can register a new user account by clicking on the “Register Now” button; you will then be prompted for additional information. Once completed, click the green checkmark. Login with an existing username and password: If you already have a username and password, enter your information and click the green checkmark. Once successfully logged in you will be presented with the Home screen, then please proceed to the next step below. Creating a truck or trailer profile allows you to provide details about your equipment and is required before pairing and installing the AppWeigh sensors. Once created the truck and trailer profiles can be easily added or removed from the Home screen giving you the ability to easily swap trucks or trailer combinations. From the “My Trucks” screen, select the + sign in the upper right. From the “Add Truck” screen, complete the form to create a truck. Click the “Done” button when finished (you can edit the profile anytime). From the “My Trailers” screen, select the + sign in the upper right. From the “Add Trailers” screen, complete the form to create a trailer. From the list, select the Truck or Trailer to edit by clicking the pencil icon next to the name. From the Edit screen scroll down and click the “Setup Sensor” button. Open the box with the AppWeigh sensor kit, and locate the sensor and the included coin cell battery. Remove the sensor cap (by holding the base of the sensor and unscrewing the top), locate where the battery inserts, and be ready to insert the battery. From the “Setup Sensors” screen, find the axle group you want to pair. Insert the battery into the sensor with positive (+ sign) facing up, then touch the sensor to the phone or tablet, and immediately click the “Pair Sensor” button. When the sensor is successfully paired you will receive a message saying it was successful, and you will now see the sensor ID number in the box next to the “Pair Sensor” button. Please note information in the sensor tracking section below for reference when installing the sensor. (If the pairing was unsuccessful, try again by removing the battery, waiting 30 seconds, and then repeating the Pair Sensor steps from the beginning. Sensor Tracking: note the axle group and leveling valve (for dual valves only) paired to this sensor. Repeat the Pair Sensor section for each AppWeigh Sensor, making sure to keep sensors separated and using the Sensor Tracking section for each sensor to keep track of which axle group the sensor was paired with. This section describes how to add your Truck and/or Trailer profile to the Home screen in the AppWeigh App. NOTE: Before starting this section the Truck or Trailer profile must be completed and the sensor(s) paired to the axlegroup in the AppWeigh App. From the Home screen, click the “Add Truck” button. The Home screen will show the selected truck. From the Home screen, click the “Add Trailer” button. The Home screen will show the selected trailer. Repeat Steps above for multi trailer combinations. 6. The Installation and configuration of the AppWeigh App is now complete – you are ready to install the sensors. 1. Ensure the fittings are tightly assembled, and attach the sensor to the fittings by screwing the sensor onto the end of the fittings. 2. Apply brakes and chock the wheels. 3. Dump the air pressure from the air suspension system where the sensor will be installed. 4. Identify the axle group where the sensor will be installed and confirm you have the correct sensor that was paired to that axle group in the previous “Pair Sensor” section. 5. Find the location in the air line to install the push-to-connect Tee Fitting. Choose a location in the air line that feeds the airbags, as close to the bags as possible (“down” from the leveling valve). 6. Cut the air line where you intend to insert the Tee Fitting. It is important the cut is at 90 degrees and the edges are square to ensure a tight connection. 7. Clean the ends of the cut air line to remove any dirt or grease. 8. Install Tee Fitting by pushing the cut ends of the air line into the ends of the Tee Fitting, apply a good amount of force to ensure the air line ends go in as far as they can. 9. Start vehicle and let the height control valve(s) charge air system to operating pressure/height. 10. Check for air leaks using soapy water and a spray bottle! 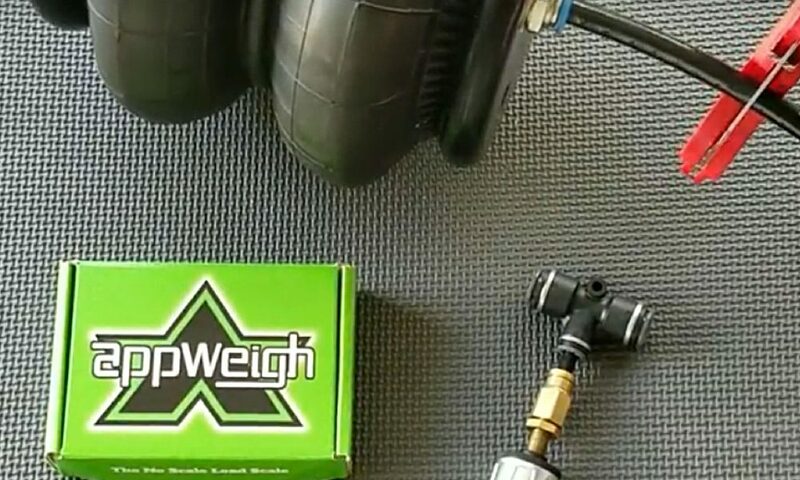 It is important that there are no air leaks in the air suspension system for the AppWeigh system to work properly. 11. Complete these steps for each AppWeigh sensor. 12. After installing all AppWeigh sensors proceed to calibration step. NOTE: To increase receiving range, install the sensor on the side or front of equipment, replacing the included 2” of air line with as much line as needed to reach the desired location.